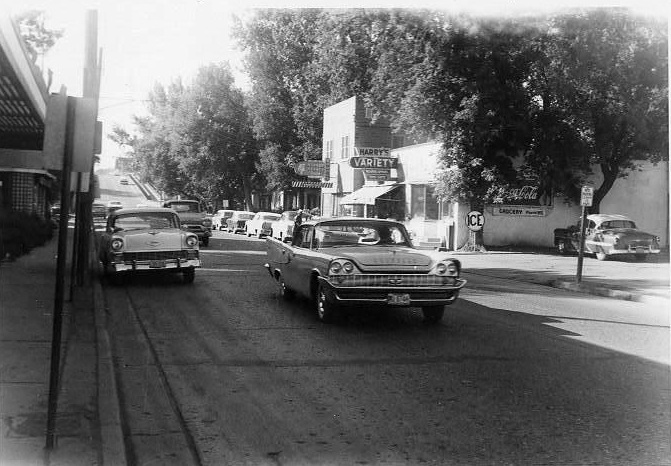 Groucho’s Circus Lot – November 1954 – Here is a car dealer in Minot in 1954 that I had not heard of…. Groucho’s Circus lot located 1 block west of the Courthouse and Groucho’s Jr. Circus lot at the foot of North Hill. I discovered the Groucho’s was actually Main Motors in Minot. 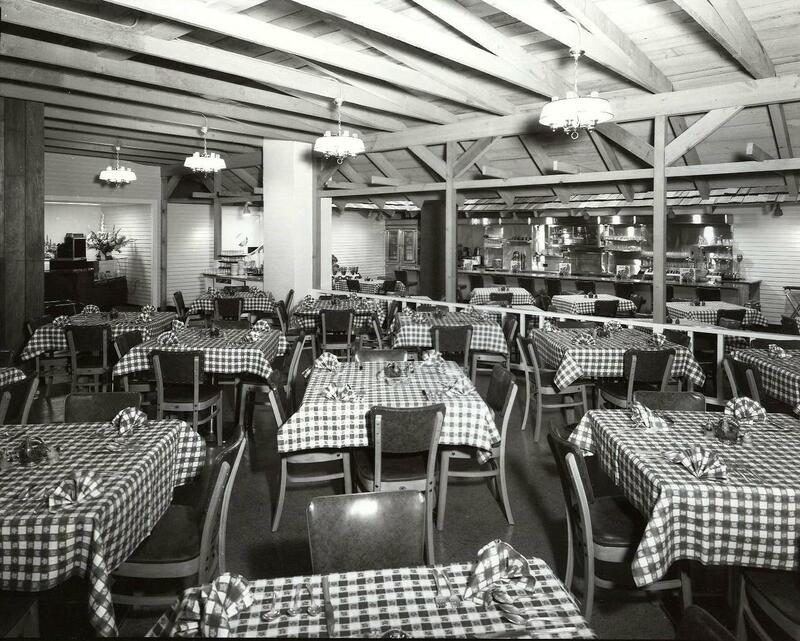 Groucho’s was advertising – “Coming Soon! 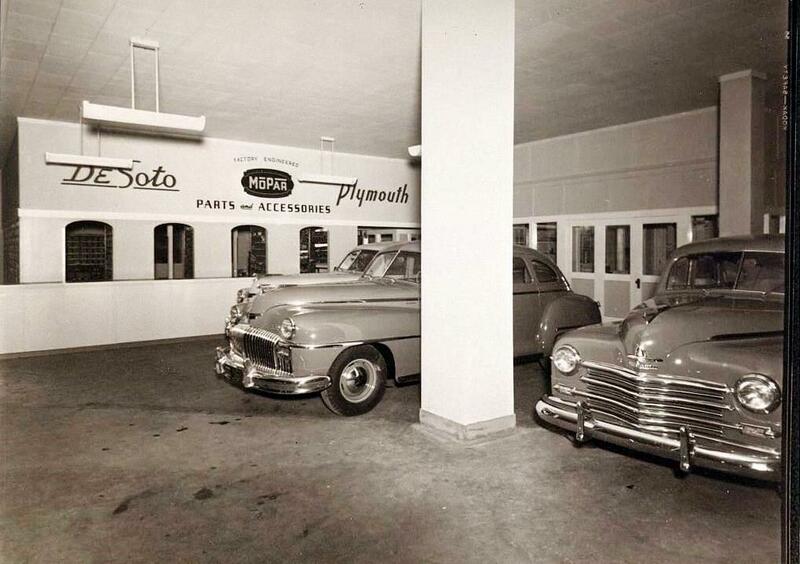 The new 1955 DeSoto and Plymouth. The Most radical changes of them all”. 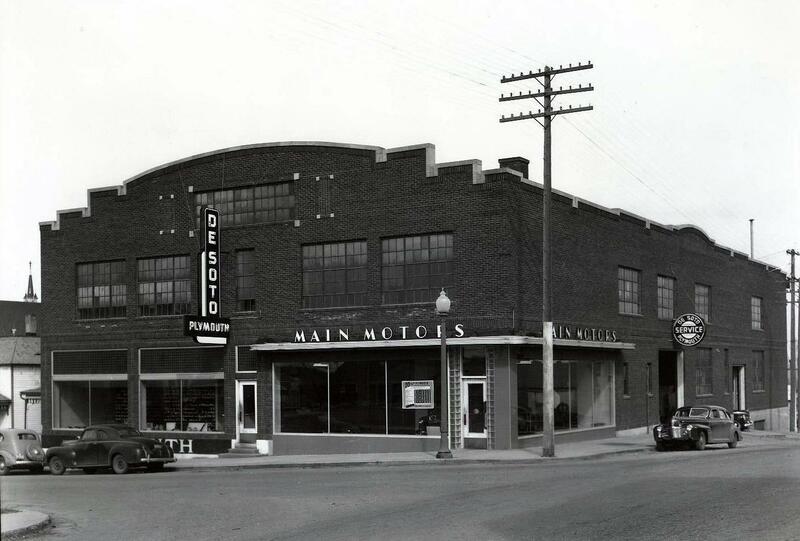 Main Motors was the DeSoto and Plymouth dealer. Groucho’s also carried used vahicles. In 1954 they were advertising a 1947 Pontiac for $195.00… a 1947 Chevrolet coupe for $175.00 and 1951 Nash 4 door for $695.00. In going through old newspapers, it appears that 1959 was a year of much entertainment. The Community Concert series opened with “ La Boheme” presented by the New York Opera Company….. a presentation od “Mark Twain Tonight” was performed by Hal Holbrook as a one man show ….. The Glen Miller Dance Band made an appearance at the Municipal Auditorium ….. and the 5th Annual Y’s Mens Indoor Rodeo took place. …… The Minot Community Players presented a play, “Curious Savage”, directed by Mrs Cameron (Barb) Mills….. The Water Follies performed at the Auditorium – the cost for the production was $16,000.00 – the largest entertainment investment since the Auditorium opened. Sept 25, 1964 – A double page newspaper ad promoting the development of North Hill sponsored by the North Hill Merchants association. The ad included a map of with the 26 North Hill Businesses involved and a map of the neighborhood. The Hill Top Bottle Shop was under construction. Harry’s Tire Service had a warehouse, Henry’s Drive In was open, Poor Rog’s Surplus and the Starlite Club were there. 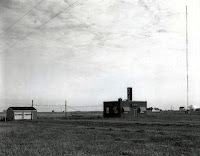 The Westland 83 Truck Stop was 1 mile north of the Airport and there were two gas stations…. 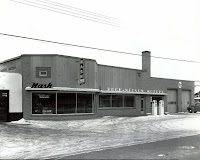 North Hill Texaco and Jerry’s Standard Service. National Car Rentals could be found at Jerry’s Standard. 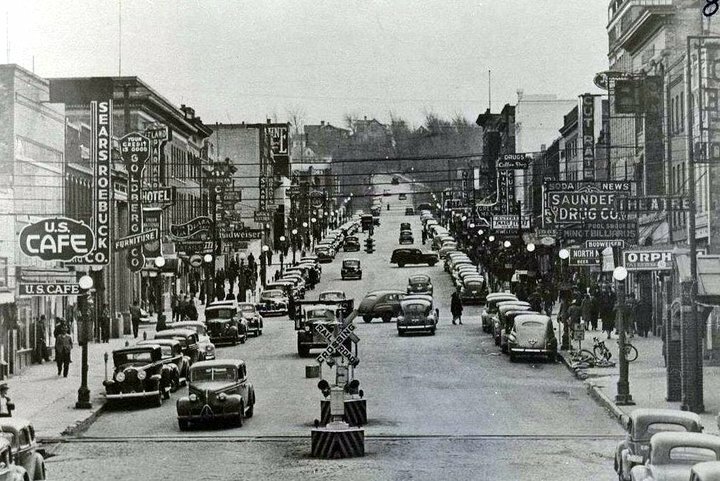 The ad also proclaimed that north hill now had “fine paved streets in every direction”. September 1964 – Sherwin Linton and the Fender Benders were the stars of the stage at The Dutch Mill…. The Dutch Mill became Friday’s and is now known as The Rocking Horse. Sherwin Linton recorded a song called White Lightning. His show featured Comedy and dancing. Sherwin Linton lately has been one of the headliners in the Copenhagen Hall stage at the Norsk Hostfest . He does a great Johnny Cash impersonation. September 1964 – KMOT-TV in Minot was expanding . They were introducing color TV to the area. KMOT was also expanding its coverage area by 32% and increasing their power by 500%. The evening would start with a kick-off pre-color show at 6:15 pm followed by “The Virginian” at 6:30 pm. All shows that evening were broadcast in color with the exception of the 10 pm news. 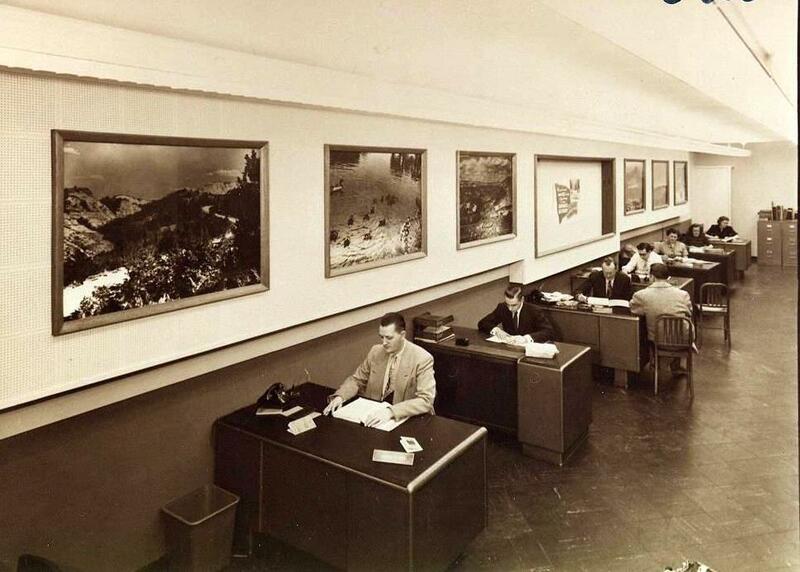 In the beginning there was to be 40 hours of color programming per week. 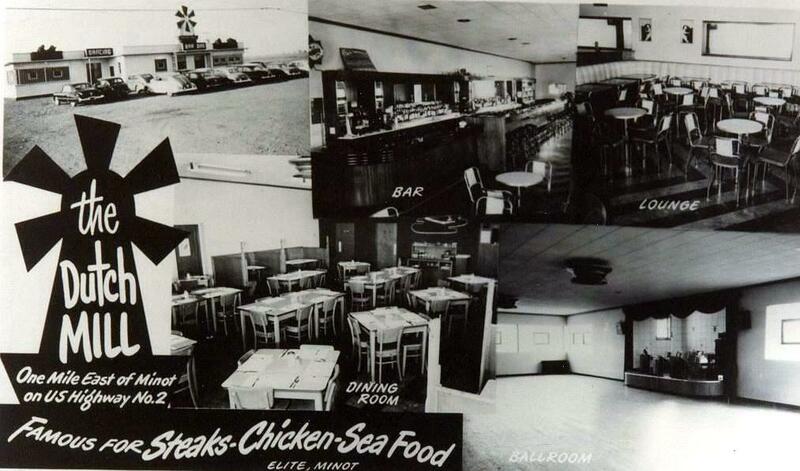 In 1964 there were two Super Fair stores in Minot. One at 338 2nd St NW (North Broadway) and the other at 1609 4th Ave. NW. Some of the specials in August were…. Frozen French fries – 9 cents foe a 9 oz package…. Frozen strawberries – 5 10 oz pkgs for $1.00 …. Sardines – 8 cents a can …. 5 fresh cantaloupe for $1.00 ….. ½ gallon of ice cream only 49 cents…. Super Fair stores also gave out Magic Stamps. A full book could be redeemed for $2.00…. The weekly dinnerware offer for the week was a coffee cup for only 9 cents. Super Fair also offered free delivery with a $5.00 order. 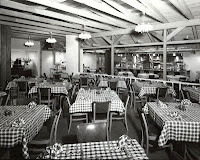 The Sweden House smorgasbord featured the Family Night Special. Henny Penny fried chicken, Swedish Meatballs, Liver and Bacon or Ocean Baked Perch … your choice, complete dinner for only 99 cents…… The Holland House Cafeteria in the Town & Country Center featured a complete Golden Fried Fish Dinner for $1.00 – all you could eat…..
From a Minot newspaper… the Starlite Outdoor Theater was showing a double feature. El Dorado, starring John Wayne and Robert Mitchum…. Cary Grant and Samantha Eggar in Walk, Don’t Run…. Tuesday nights were Bargain Nights. 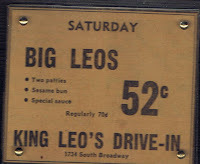 Adult admission was 50 cents and children under 12 were free….. The Empire Theater was showing Planet of the Apes, continuous shows at 1-3-5-7-and 9. Oak Park Theater was showing Around the World in 80 Days. The headlines in the Minot Daily News on October 31, 1958 we: 15 B52’s to be based in Minot. The article goes on to state that 15 giant B52 bombers and 10 KC135 aerial tankers will be stationed at the Minot Air force Base. The total number of planes was expected to be about 60 including interceptors, bombers, tankers and auxiliary planes. The base was expected to combine both SAC, Strategic Air Command and ADC, Air defense Command. 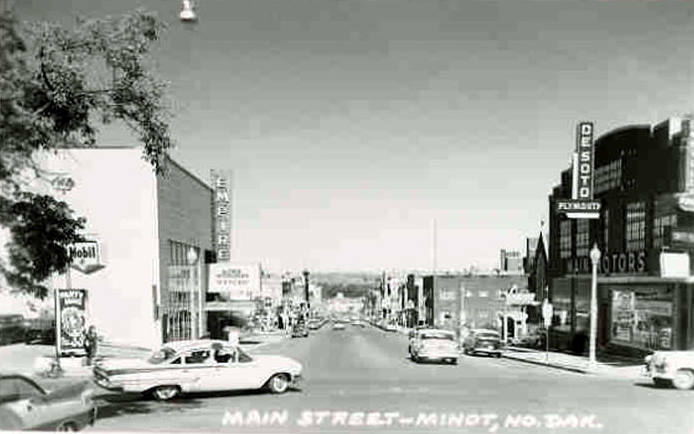 Early Theaters in Minot - Strand Theater - In the early days the Strand Theater located at 102 North Main Street was home for silent movies in Minot. At one time the Strand actually featured a piano player and a small orchestra pit that provided the music for the “Silent Movies’. Later, Saturday afternoon matinees were a western preceded by a serial feature, The price of admission was about 10 cents. State Theater – located at 206 South Main Street at one time was the fanciest theater in Minot. After it closed the building became the home of the S&L Department Store. 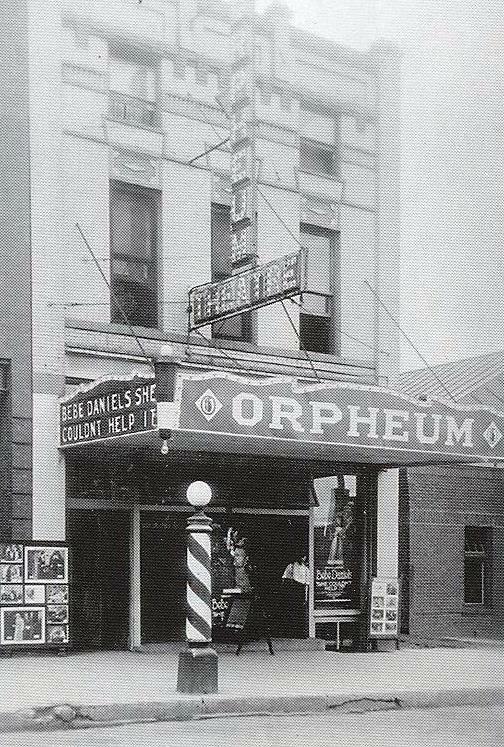 The Orpheum Theater – This was probably one of the oldest theaters in Minot. 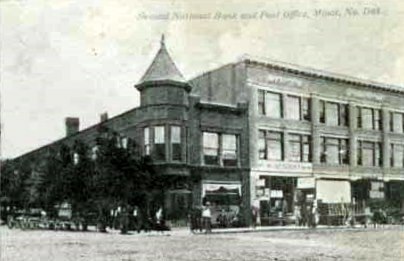 It was located on North Main, just south of the Soo Line Depot. Rumor has it that is was like going to a dungeon and reportedly one could occasionally feel rats running across your feet. A listener brought me a card table from a past Minot Club that had advertisement s on it. Some of the Businesses are still around and some are not. I thought it was unusual but I suppose selling the ads on the top of the table is no different than on menus or anything else. 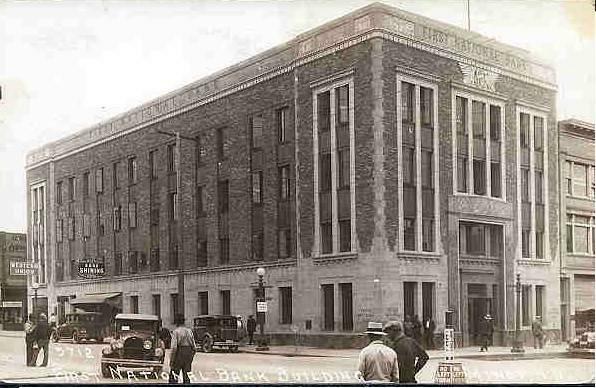 Businesses on the table are: First National Bank – the oldest and largest bank in Northwest North Dakota…. Anderson Blacksmith Shop – General blacksmithing and building trailers and hitches …. City Bakery – 210 South Main …. Novak’s Cleaners – 10A Central Avenue West and Alm’s Milk Products with three stores to serve you. 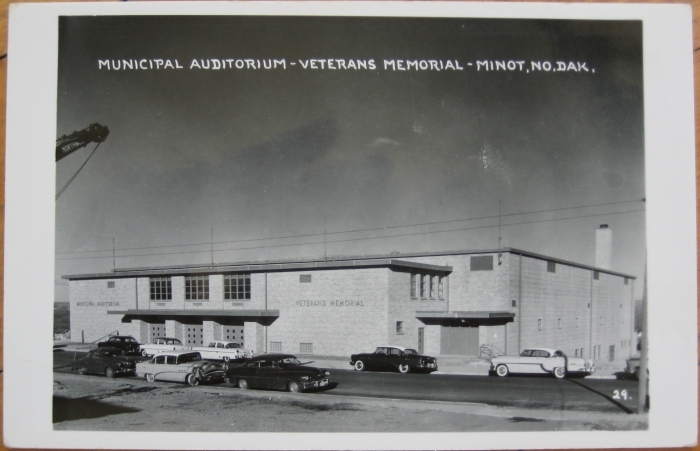 On Wednesday, March 25, 1959 the Grand Ole Opry made an appearance in Minot at the Municipal Auditorium. They put on one show. The headliners included Minnie Pearl, Bobby Helms, Jean Shepard, Hankshaw Hawkins and Red Sovine. Red Sovine performed his hit “Why Baby, Why.” There was also an extra attraction with the Echo Valley Boys. Admission for adults was $1.25 in advance or $1.50 at the door. 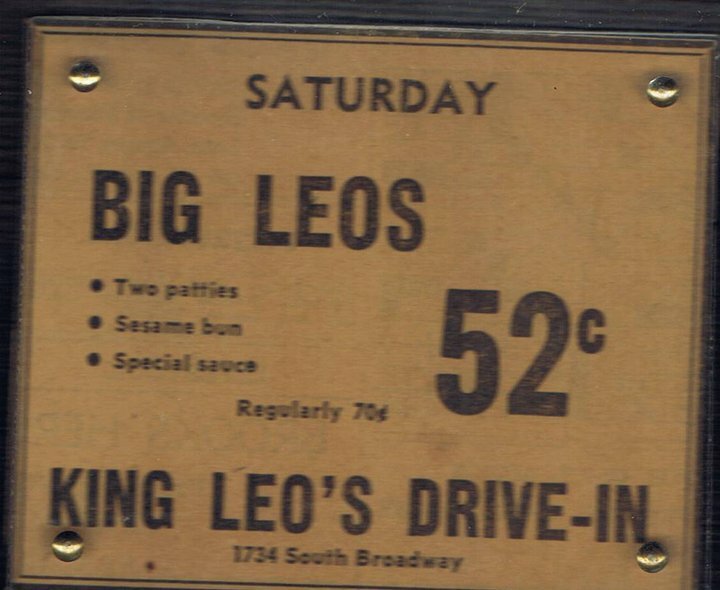 Children were admitted of 35 cents. 101 Ranch Real Wild West Show – On July 10, 1912 the Wild West show was coming to Minot. 50 cents was the admission and they featured two shows, rain or shine. 101 Ranch Wild West Show claimed to be the largest exclusive western show in existence showing the west as it was. The show featured Dusky Demon of Oklahoma, the only man in human history who barehanded fought a Spanish Bull. The show also had Cowboys, wild west girls, Indians, homesteaders, pony express, senoritas, vacqueros, buffalos, bucking horses and long horned steers. It claimed to show the history of frontier life. The Wild West Show also held a parade in the morning of the day of the event. 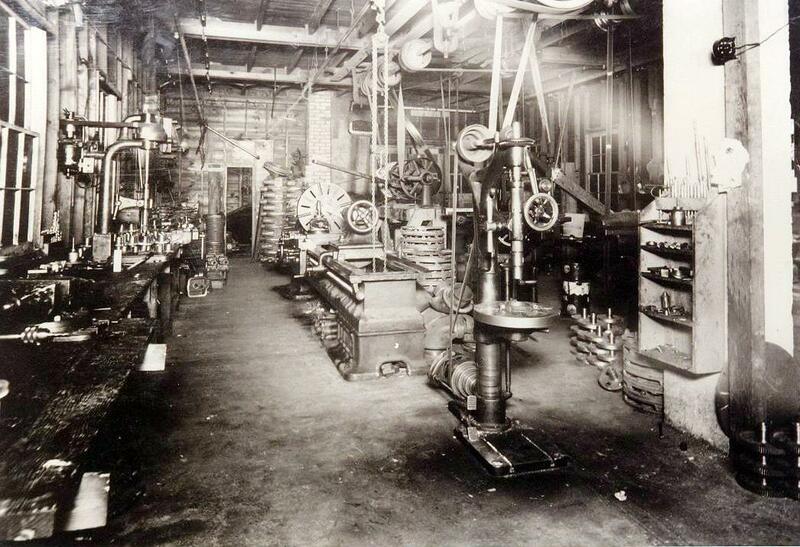 1912 Minot Daily Optic – Paul McCoy & Co. – This store was located in the Leland Block on Main Street in Minot. In a newspaper ad in 1912 in the Minot Daily Optic they were featuring the following: Men’s black or tan socks 11 cents a pair, Silk stockings so men – 38 cents a pair, men’s union suits for 94 cents. Paul McCoy & co. also had on sale an Eastman Kodak postcard camera for only $20.00, Sherwin Williams and Masury’s house paints for $150 a gallon and box candies that originally sold for 35 cents to $1.00 on sale for 17 to 50 cents. 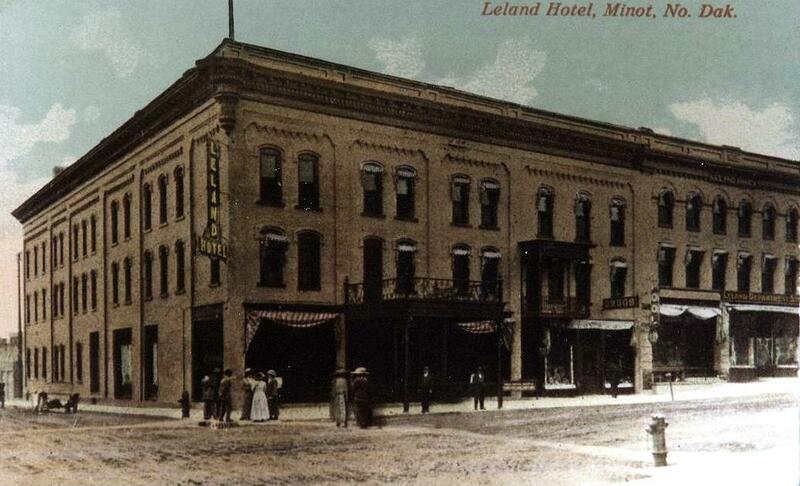 The Leland Hotel is pictured below in the early 1900's.